This is a common situation around the world that deteriorates people’s lives. Most times the water is not clean so illness is common and kids can’t study because they spend most of their day getting water. 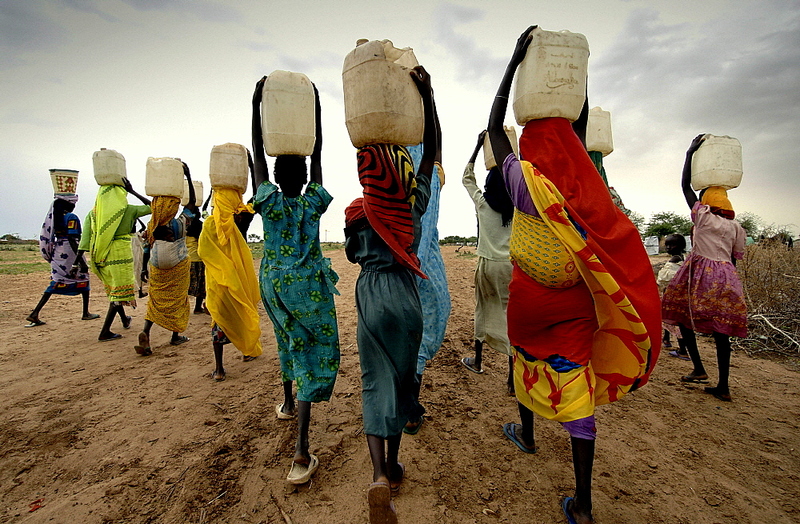 Women carrying water collected from taps installed by international aid agencies in a camp for internally displaced persons (IDPs). They fled their homes after being attacked by Janjaweed militias. Right now, 650 million people don’t have access to safe water. Without this basic service, they have no choice but to drink dirty water that could kill them. Cynthia Koenig is the founder of Wello, an award-winning social venture that co-creates disruptive innovations designed to provide better, more reliable access to safe water and introduces opportunities for families to break free from the cycle of poverty. She is a firm believer in the potential for business to alleviate poverty. Her career has focused on incubating mission-based businesses designed to alleviate poverty in the developing world. She has helped launch ventures of all shapes and sizes, ranging from community-run ecotourism businesses in Mexico and Guatemala to a national strategy for sustainable tourism development in Bhutan. Her nearly two decades of living in and working with communities throughout Central America, Southern Africa, South and Southeast Asia have given Cynthia deep insights into the challenges and opportunities facing consumers who struggle to survive at the base of the economic pyramid. These experiences led her to launch Wello.